To Cite: Ghasemian A, Najar-Peerayeh S, Bakhshi B, Mirzaee M. High Prevalence of icaABCD Genes Responsible for Biofilm Formation in Clinical Isolates of Staphylococcus aureus From Hospitalized Children, Arch Pediatr Infect Dis. 2015 ; 3(3):e20703. doi: 10.5812/pedinfect.20703v2. Background: The icaABCD genes encode a Polysaccharide Intercellular Adhesion (PIA), which is a tight structure protecting Staphylococcus aureus community against adverse environmental conditions. The ica dependent biofilm formation plays an important role in persistent infections in hospitalized patients. Objectives: The aim of this study was to detect icaADBC genes encoding PIA among S. aureus isolates from children in Loghman Hospital of Tehran. Materials and Methods: We collected 22 clinical specimens from hospitalized pediatrics and identified the isolates. Then, we detected mecA gene among Methicillin Resistant S. aureus (MRSA), SCCmec types and icaABCD gens by PCR assay and specific primers. Results: Five isolates (22.7%) were methicillin resistant (MRSA) and mecA gene was detected among them. All the MRSA isolates harbored SCCmec type III. Prevalence of icaA, icaB, icaC and icaD in the isolates were 16 (73%), 14 (63.6%), 16 (73%) and 16 (73%), respectively. Moreover, all the MRSA strains were icaADBC positive. Conclusions: Prevalence of icaADBC genes was relatively high among children and also all the four ica genes were detected among MRSA strains. S. aureus clinical isolates, especially methicillin resistant strains, are the causative agents of various clinical signs such as folliculitis, boils, impetigo and cellulitis, which are important in children (1, 2). S. aureus infections have been sharply increased during the recent years and associated with more mortality than other bacterial agents (3). Attachment and colonization is the first step for Staphylococcusaureus pathogenesis. Biofilm formation leads to bacterial resistance to higher concentrations of antimicrobial agents in addition to host immune responses (4). The self-produced polymeric matrices adhere to inert and living surfaces (5). Penetration of antibiotics reduces through S. aureus and S. epidermidis biofilms (6), although carbon and amino acids can be adsorbed by the biofilm layers (7). Some of special clonal complexes (e.g. clonal complex 8) are capable to adhere to different surfaces and produce a large amount of biofilm (8). The icaADBC genes, encoding PIA play important roles in biofilm formation among S. aureus and S. epidermidis isolates (9). Infections caused by isolates producing slime layer are difficult to treat. Many chronic infections due to S. aureus, especially through medical devices, are associated with biofilm formation (10, 11). Strong biofilm producer isolates are more virulent with severe post-surgical infections (12). The ica dependent biofilm formation develops by production of a polysaccharide inter cellular adhesion (PIA- PNSG/ poly- beta-1, 6-N-acetylglucosamine polymer) by the N-acetyl glucose aminyl transferase enzyme (13). Two ica A and D genes in the operon encode this enzyme. The other genes in this operon include icaB (polysaccharide deacetylase), icaC (transporter of PIA) and icaR (the regulatory gene). In Akiyama’s study, all S. aureus strains tested in skin lesions of impetigo, atopic dermatitis and pemphigus were covered with glycocalyx and formed microcolonies (14). Systemic and intravenous Staphylococcal isolates have been shown to harbor ica genes as twice as the normal flora of healthy volunteers (13). Most reports have detected some of these genes. The aim of this study was to detect the icaADBC genes encoding PIA among clinical isolates of S. aureus from children in Loghman Hospital of Tehran. We collected 22 S. aureus isolates and then identified them with coagulase, manitol fermentation, colony morphology and DNase tests. Methicillin resistant isolates were identified in the phenotypic test by disk diffusion with oxacillin disk. Bacterial isolates were suspended in 200 µL of TE buffer and then lysostaphin was added (comprising 200 µL of TE buffer and 20 µL of lysostaphin [2 µg/mL, Sigma]). Genomic DNA of S. aureus isolates was isolated according to Straubinger method (15). The mecA gene was detected with specific primers indicated in Table 1 (16). PCR reaction mixture comprised of 9.5 µL distilled water (DW), 2 µL DNTPs (10 mM), 1.5 µL MgCl2 (50 mM), 1 µL of each primer, 3 µL 10X PCR buffer (200 mM), 2µL Taq polymerase (500 U) and 5 µL template DNA. The thermal profile included initial denaturation at 94°C for 5 min, followed by 30 cycles of 94°C (30 s), 55°C (30 s) and 72°C (30 s) and final extension of 72°C (4 min). Reaction mixture for SCCmec types was 94°C (1 min), 51°C (1 min), 72°C (1.5 min) and final extension of 72°C for 10 min. Moreover, thermal profile for icaA gene concluded with 94°C (5 min), followed by 30 cycle of 94°C (1 min), 52°C (30 s) and 72°C (1.5 min) with final extension of 72°C (10 min). The annealing temperature for icaB, icaC and icaD set as 55°C for 1 min (17), shown in Table 2. 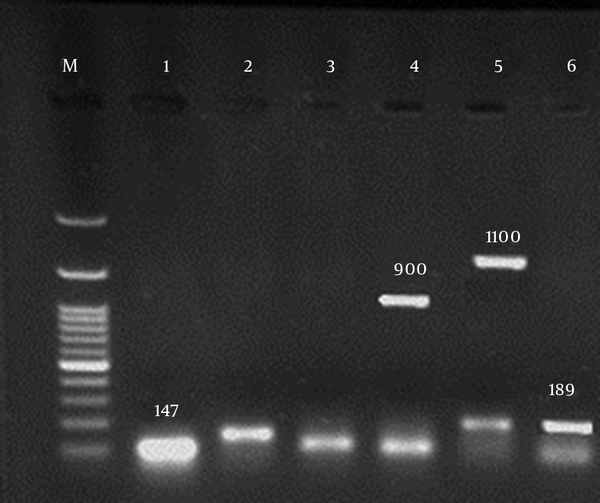 PCR products were electrophoresed in 1% gel agarose in 1X TBE buffer with staining of 1 µL of each loading buffer and gel red and then observed under UV emission. Pearson Chi-Square was used to data analysis. A P < 0.05 considered significant. Five (22.7%) isolates were resistant to oxacillin (1 µg), moreover all the isolates were susceptible to vancomycin (2 µg) and linezolid (30 µg) disks. The mecA gene was detected in all five isolates (22.7%) with 147 bp size. All the MRSA isolates harbored SCCmec type III. Furthermore, the prevalence of icaA, B, C and D in the isolates were 16 (73%), 14 (63.7%), 16 (73%) and 16 (73%), respectively as depicted in Figure 1. Interestingly, all MRSA isolates harbored all of icaADBC genes, suggesting that MRSA isolates may be more capable of PIA synthesis and biofilm formation (Table 3). However, there was no significant difference between MRSA and MSSA strains for the presence of icaADBC operon. M: marker. columns 1, 3 and 4: mecA gene. column 2: icaA with 188 bp. columns 5 and 6: icaD gene with 189 bp. columns 4 and 5: icaB and icaC with 900 and 1100 bps, respectively. All the studied isolates were susceptible to vancomycin and linezolid; although these drugs are the last choices for treatment of S. aureus infections, resistance to vancomycin has been sporadically reported from some areas of the world, similar to Iran (18, 19). Moreover, resistance to linezolid was detected in 19 of 20 isolates studied by Armin et al. (20). In this study, all MRSA strains harbored SCCmec type III. In the study of Japoni et al. (21) from south of Iran, SCCmec type III was the predominant type. MRSA strains harbor several virulence factors that develop more clinical signs (17, 22). Also the study by Imani Fouladi et al. (22), 75% of Staphylococcus aureus isolates with the SEB gene were Methicillin resistant and 15% were MSSA. In the study of Rahimi et al. (23), all the isolates were susceptible to vancomycin and most were susceptible to SXT. MRSA isolates harbored all icaADBC genes, suggesting that these isolates are strong biofilm producers and considered to cause chronic and persistent infections (24). Polymeric Intercellular Adhesion (PIA) plays an important role in attachment of bacteria to each other and to accumulate with multilayered biofilm. Catheter and blood stream Staphylococcal infections play an important role in biofilms (25, 26). We confirmed no significant difference between MSSA and MRSA isolates of S. aureus regarding the presence of icaADBC genes, similar to survey Atshan et al. (27), in which icaADBC genes were compared between MRSA and MSSA. Furthermore, we previously observed that most isolates belonged to accessory gene regulator (agr) group I (28), but the relationship of agr groups and icaADBC expression needs more studies. Several studies indicated the role of icaA and icaD genes in biofilm production and several reported that all of isolates were icaA positive (29). In the study by Hou et al. (30), among 55.56% of isolates that produced biofilm phenotypically, 11.11% had icaA gene, but other genes were not investigated. In this study, methicillin resistant isolates harbored higher rate of icaADBC genes, similar to studies conducted by Khan et al. (31) and O’neill et al. (32). However, Smith et al. (33) detected no significant correlation between susceptibility to methicillin and biofilm formation. Variations in the presence of icaADBC genes from studies might be due to epidemiological varieties and periods that these isolates have been collected. Most of previous studies focused on the icaAD genes that encode PIA; likewise, these studies have not determined whether MRSA strains could produce PIA significantly more than MSSA isolates. For instance, Nasr et al. (34) detected icaAD genes in 32% of blood and catheter isolates. In the other study, 36 of 46 Staphylococcal isolates harbored icaA and icaD genes; while Grinholc and coworkers did not detect icaD, but all strains were icaA positive (35). Terki et al. (36) detected icaAD genes in 17 (38.5%) of 44 staphylococcal isolates from urinary tract. In the other study, biofilm formation in most isolates was PIA dependent (37). Smith et al. (33) depicted that isolates of S. aureus from infected skin lesions were significantly more capable of producing biofilms than those isolated from blood and other infected sites. In the study of Semczuk et al. (38), all the isolates forming biofilm phenotypically, harbored icaAD genes. Satorres and Alcaraz (13) suggested that the ica genes might be more prevalent in Staphylococcus strains isolated from hospitalized patients or staff, than healthy individuals or the community. The limitations of this study were loss of healthy individuals, environmental strains and low number of isolates. In conclusion, the prevalence of icaADBC genes was high in hospitalized children in center of Tehran. There was no significant difference between MRSA and MSSA isolates of S. aureus regarding the presence of icaADBC genes, although all methicillin resistant strains harbored all the icaADBC genes. The authors acknowledge the staff of the Laboratory of Loghman Hospital of Tehran for providing clinical isolates. This study was obtained from a thesis of Master of Sciences in Faculty of Medical Sciences, Tarbiat Modares University, Tehran, IR Iran. Authors’ Contributions: Abdolmajid Ghasemian followed the microbiological and molecular laboratory studies. Shahin Najar Peerayeh designed the thesis of research, Bita Bakhshi and Mohsen Mirzaee advised the research. Funding/Support: This work was supported by grants for a thesis from Faculty of Medical Sciences of Tarbiat Modares University, Tehran, IR Iran.